Kontrol Kubes are the perfect solution for dust containment during hospital maintenance and inspections. Dust can be generated by daily maintenance work or common inspection procedures. 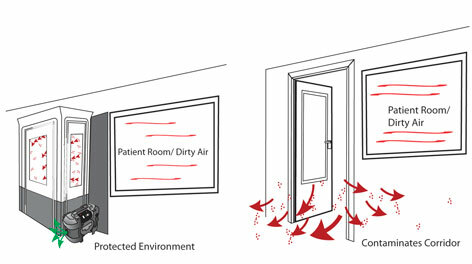 Without appropriate dust control measures in place, this airborne hazard can dramatically impact patient outcomes. Kontrol Kubes can be deployed quickly and easily to eliminate the spread of harmful dust and particulate. Because dust is drawn into the unit by the HEPA filtered negative air machine, maintenance teams can work knowing that the dust they generate will not impact patient outcomes. A patient is admitted for injuries recieved in an accident. After being admitted the patient is diagnosed with MDR-TB. Kontrol Kube can be quickly deployed and placed on any door converting a standard patient room into a temporary Airborne Infection Isolation room. This aspect of the Kontrol Kube makes it an excellent solution for additional surge capacity as well. - Kontrol Kubes can be purchased using HRSA/ASPR Funding. Kontrol Kubes assist in increasing surge capacity in the event of an outbreak. Pandemics & bio-terror events don't happen on a schedule. For that reason a hospital must be ready and able to act on a moments notice to accomodate and possibly isolate a sudden surge of patients. But you don’t have to suffer at the hands of fate with top-quality mobile containment units and products. At First Place Supply, we pride ourselves on containment units that are made out of tough, dependable materials. Containment units that keep you safe. That keep the environment safe. That keep your business safe. Take a look at our lineup of goods. Advanced enclosures. Carbon filters. DOP filters. Fiberlock collapsible decontamination showers. 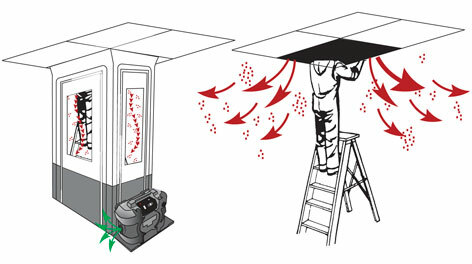 Fiberlock HEPA-filtered negative air machines. Topsider enclosures. Wherever you turn, we have something that will contain the spill, contain the damage, and reduce your risk of liability. That’s how we look out for our customers. On our site we have many different products designed for busy contractors and professionals just like you. Each one of them plays its part in making you safer. And safety doesn’t have to cost a lot. We offer uni-frame poles for as little as $338.10. We can find you a DOP filter for as little as $259.70. And our unit wheelbases (which go with any and all containment units) can be yours at a cost of only $821.33. These are products that will pay dividends for years to come. For one low price, you can have a peace of mind that you’ve never had before. Make an investment today in case something bad happens tomorrow.